Abigail was the beloved wife and advisor of John Adams, who helped create a new nation. She was the mother of another president, John Quincy Adams. Abigail ran the family farm in Braintree while John was off in Philadelphia negotiating the Declaration of Independence. Her letters to him are filled with the concerns of family and business, much love, and a famous admonition for him and his fellow Congressmen to "remember the ladies." She became First Lady of the new United States when John became its second president. They lived in the brand-new White House for just a few months, as it was completed at the end of his term. Most of their time was spent in the President's House in Philadelphia, or at their farm. Abigail is an unusual combination of down-to-earth Colonial housewife, well-versed in the dozens of complicated tasks needed to run a farm and feed a family, and a literate writer of letters, fully engaged with the social and political issues of her day. 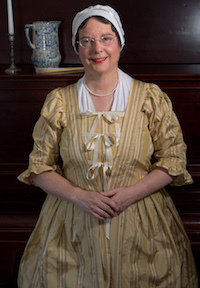 Chatting with her is a fascinating peek into the way people lived and thought in New England 250 years ago.